Understanding oncology frequently requires us to interrogate archival samples. At Asuragen, we own a unique tumor bank of >100,000 clinical specimens. These specimens span over 100 discrete cancer types across all major classes including melanoma, ovarian, breast, colon, and non-small-cell lung cancers. Our specimens are formalin fixed, paraffin embedded (FFPE) tissues, the majority of which are coupled with full histologic and demographic information. Our large repository of pathology specimens is routinely used for the development and validation of our own portfolio of products and is available for our custom and companion diagnostics partners. For FFPE inventory and pricing, please complete this form and a representative will contact you shortly. 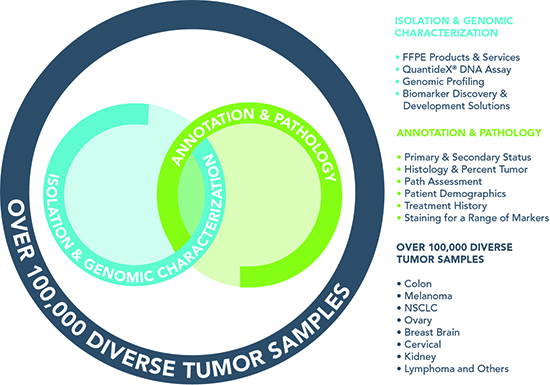 Table below shows the available, characterized oncology specimen types available within the Asuragen Tumor Bank. *Tissue samples may be subject to availability. To inquire about inventory, please complete this form and a representative will contact you shortly. Accurate quantification and high analytical sensitivity of low abundance mutations are important considerations for molecular profiling of cancer. Asuragen’s tumor bank offers a large collection of cancer subtypes with associated specimen data available including histology, demographic and molecular characteristics. This diverse sample collection can be utilized in model assays to identify both common and rare variants that may be clinically relevant to a given disease and successfully incorporated into both basic and clinical cancer research. Use of the QuantideX® qPCR DNA QC Assay helps you protect valuable FFPE tissue samples in sequencing projects by providing in-process DNA quality control testing. Asuragen provides unparalleled quality control (QC) sample testing for DNA sequencing projects utilizing the proprietary QuantideX® qPCR DNA QC Assay. The QuantideX® qPCR DNA QC Assay is a multiplexed quantitative PCR assay that measures the absolute copy number of PCR-amplifiable DNA in a sample and reports PCR inhibition. The QuantideX® Assay determines the functional quality of sample DNA using the QFI™ Score, which is the fraction of total genomic DNA copies that can be amplified. The QFI™ Score and copy number of amplifiable DNA provide actionable guidance that informs the input into NGS target enrichment and helps assure high analytical sensitivity and specificity. In addition, it flags PCR inhibitors in the sample and provides an opportunity to salvage such samples through a subsequent clean-up step prior to further processing. Paired with Asuragen’s comprehensive project design, sequencing and data analytics, the QuantideX® Assay gives researchers the unprecedented ability to discover the relevant biomarkers and underlying biology within challenging samples. 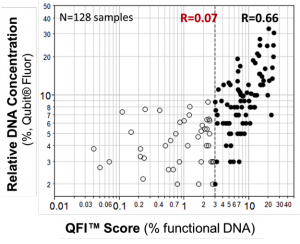 Correlation between the QFI™ Score and Qubit® DNA concentration for 128 residual clinical samples. FFPE tumors with low levels of functional DNA are identified by the QuantideX® Assay, but not by the Qubit® assay (Sah et al., 2013).